Well, usually, “The Beginning” tends to come after some trilogy, but, eh!, who cares ! 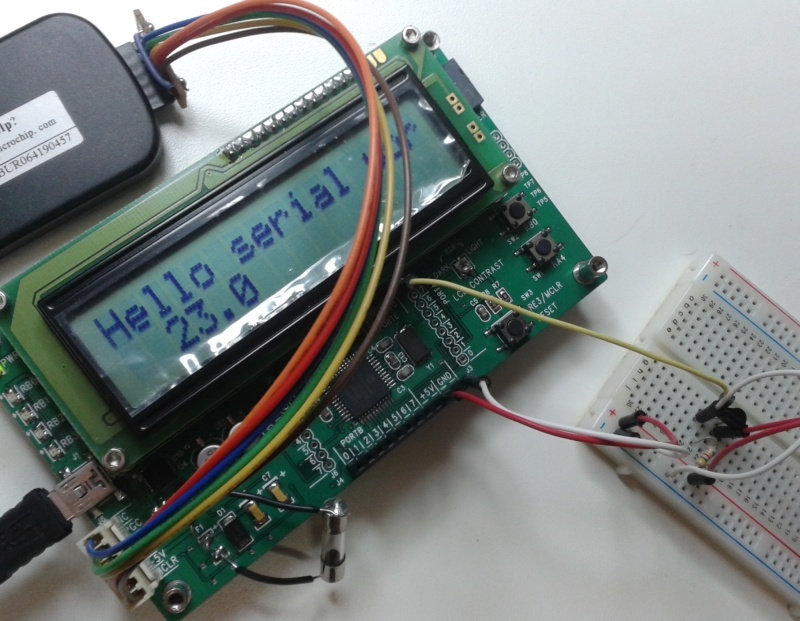 Part 1: Getting my Sure Electronics PIC DEM2 Demo board to read temperature data from a DS18B20, show it on the onboard LCD screen and send it on the serial connection. The PIC DEM 2 board, also called DB-DP113, is a fully featured board, with a PIC 18F4520, an H44780 compatible 16×2 LCD and an USB port. Carefully reading the datasheet of the 4520, one will notice it doesn’t feature an USB connection. The board has a USB-UART converter on board. Sure provides some example code, but only in microC, so I started from scatch in JAL. JAL is a C-like language, close to Python or PHP. It all starts with some includes and configuration bits, then the actual code is very simple, thanks to the extensive JAL library. There is a lib for the LCD, for the DS18B20 (1-wire) and for the serial connection, isn’t it GREAT ?! One tricky part is the configuration of the speed, the quartz (Xtal) is oscillating at 20MHz but for some reason, I had to declare the speed at 48MHz, and set the OSC parameter to HS_PLL. There must issues, but the whole works now (it seems that the LED is blinking too fast, while it should stay on for ~0.7 seconds). -- inform user PIC is ready ! var byte str2 = "                "
Note the presence of the PIC KIT 2 programming tool (the PIC DEM2 board has an ICSP connector)! The temperature is sent over the serial-usb cable and visible in the console open on my PC. It is also shown on the LCD. 1 May 2014 in Electronics. I’m trying create a similar circuit: A light dimmer which can be controlled over Xbee. Currently I’m pulling the PIC out of the breadboard and into the programmer for every development cycle. You can imagine that I’ve done that maybe 100 times already. Actually I’d like to use the ICSP, however the PIC and XBee run on 3.3V. 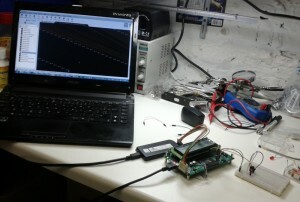 I’m afraid that the programming voltages will kill the XBee. Do you know a good way to make the development cycle (code alterations) a bit more developer-friendly? And good luck with your project. Do you have a weblog of this build ? I’m curious to see that light dimmer over Xbee !